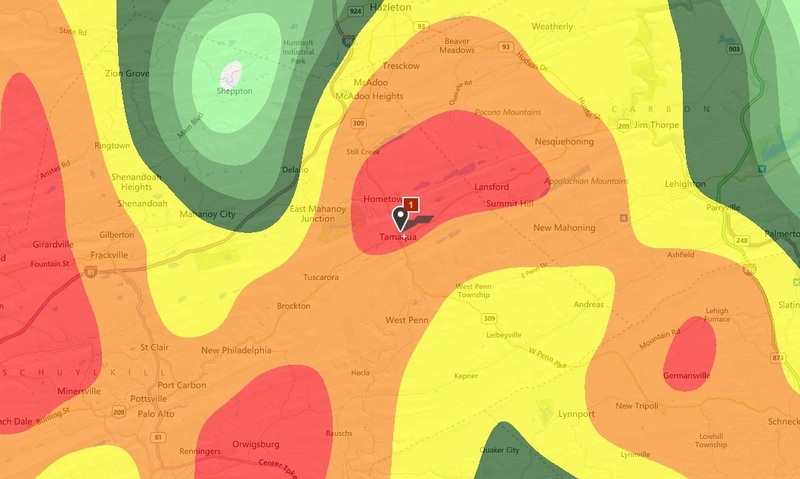 Image courtesy of The Weather Channel via Weather.com. The National Weather Service in State College has issued a Flash Flood Watch for our area until midnight tonight (Thursday, August 20, 2015). * FLASH FLOOD WATCH FOR A PORTION OF CENTRAL PENNSYLVANIA… INCLUDING THE FOLLOWING AREAS… ADAMS… CUMBERLAND… DAUPHIN… LANCASTER… LEBANON… SCHUYLKILL AND YORK. * UNTIL MIDNIGHT EDT TONIGHT. * DOPPLER RADAR ESTIMATES AND SPOTTER REPORTS INDICATED THAT 3-5 INCHES OF RAIN HAS FALLEN SINCE LATE THIS MORNING ACROSS PORTIONS OF NORTHERN AND WESTERN ADAMS COUNTY… WITH LESSER AMOUNTS THUS FAR TO THE NORTH AND EAST ACROSS THE LOWER SUSQUEHANNA VALLEY. * NUMEROUS SHOWERS… AND SOME BRIEFLY TRAINING THUNDERSTORMS COULD BRING ADDITIONAL… BUT HIGHLY LOCALIZED 2 TO 3 INCH RAINFALL AMOUNTS ACROSS THE WATCH AREA LATE THIS AFTERNOON AND EVENING.